Saturday May 23 1908 I baked a cake and did a lot of work about the house. Will went out to plant but was driven in by rain he went to town before dinner. but finished the planting in the afternoon. I was down to Woolfs. I have a lot more little chickens coming out. To bed early. Sunday May 24 1908 I hurried through with my work and went to church I got our dinners when I came home. Took more little chickens from the nests and it was three oclock before I could rest and read [illegible]. I did the evening work and went to bed early. 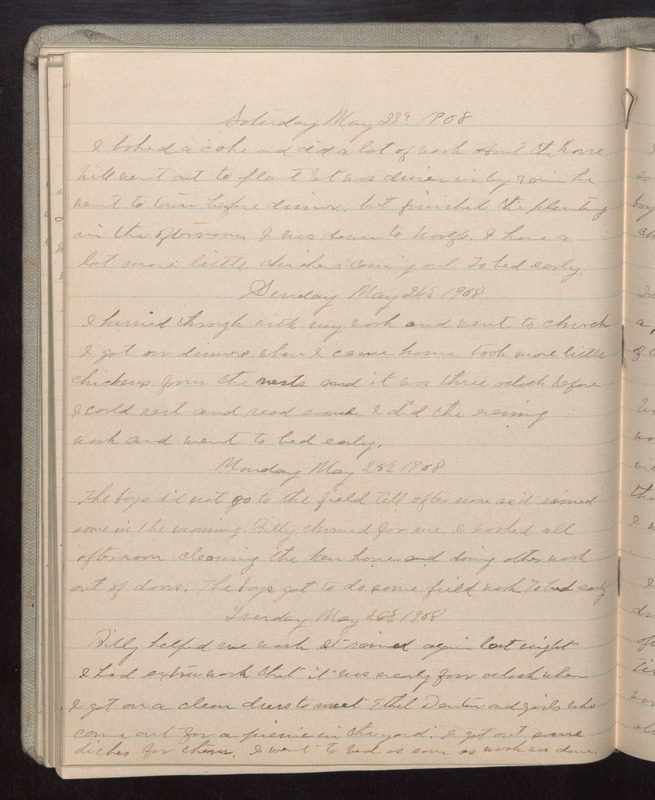 Monday May 25 1908 The boys did not go to the field till after noon as it rained some in the morning. Billy churned for me. I worked all afternoon cleaning the hen house and doing other work out of doors. The boys got to do some field work. To bed early. Tuesday May 26 1908 Billy helped me wash. It rained again last night I had extra work that it was nearly four oclock when I got on a clean dress to meet Ethel Denton and girls who came out for a picnic in the yard. I got out some dishes for them. I went to bed as soon as work was done.